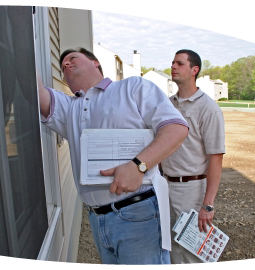 Because new homes are different than existing homes, they require a different type of inspection. If you're having a home built, All About U Home Inspections can provide inspections at various stages through the construction process. This will ensure that we have an opportunity to evaluate individual systems when they are visible. Please contact [link to "contact us"] our office for more details on the staged inspections available during the construction of a new home. If you're buying a new home that has already been completed, we can provide a detailed inspection of the finished product. Because the new home has not been through the test of time, the inspection is more of a predictive than a performance-based evaluation. We rely on current codes and building standards to determine whether things have been done properly. For new homes, All Abou U Home Inspections can provide an inspection prior to closing and we also recommend an inspection when the home is roughly 11 months old - just before the expiration of the one-year warranty. This second inspection allows us to evaluate the condition of the home once it has been lived in and has had a chance to perform. There are many issues that arise after a home is occupied and has been through a full year's weather cycle. The first year also provides an opportunity for backfilled ground around the home to settle and for the home to establish equilibrium with respect to moisture. Contact us today to book an inspection for your new home.